Classic stand-up arcade games. The joystick. The buttons. The feel of the stick, the clack of the buttons. 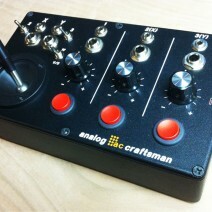 Fond memories… How to integrate that feeling with my synthesizer… Now, direct your synthesizer like your favorite video game. 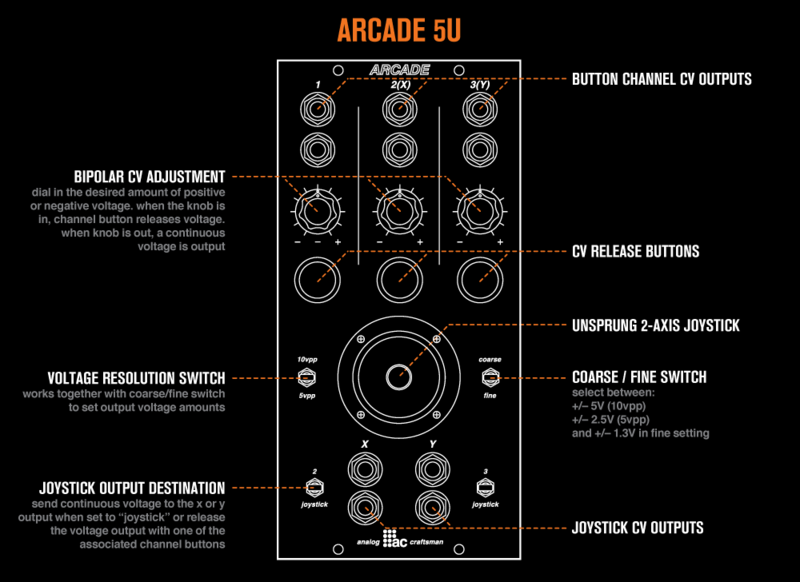 ARCADE is a control voltage controller. 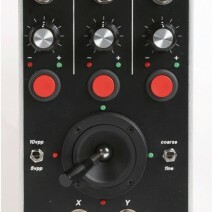 Three channels of buttons, each with a pot to adjust the positive or negative voltage release. 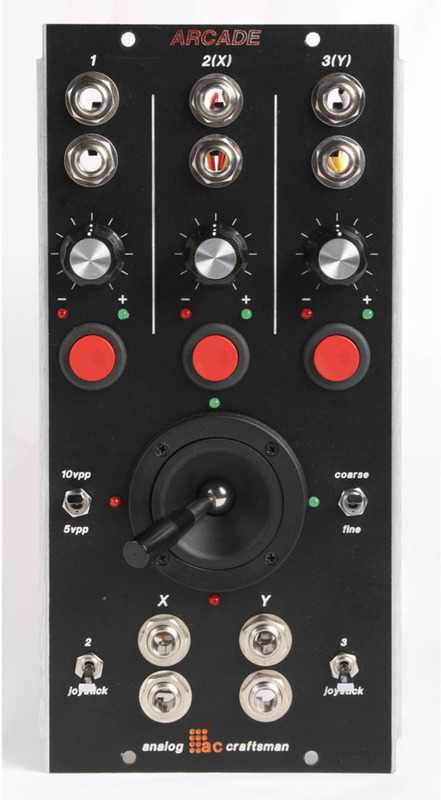 Press the button to trigger EGs, drum modules, sequencer start/stop, or hit it rapidly while twisting the knob to create real time sample and hold type patterns. Not enough? Pull the knob and switch to “always on” mode. 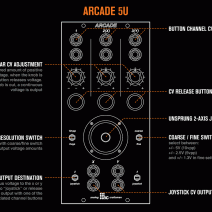 Use ARCADE as a remote control for your favorite CV parameters, slowly open and close that LPF, or use it to mix volume levels with three VCAs. Want more? X and Y axis joystick with positive and negative voltage output. Send the two axis to the pitch of two VCOs and create some FM madness. 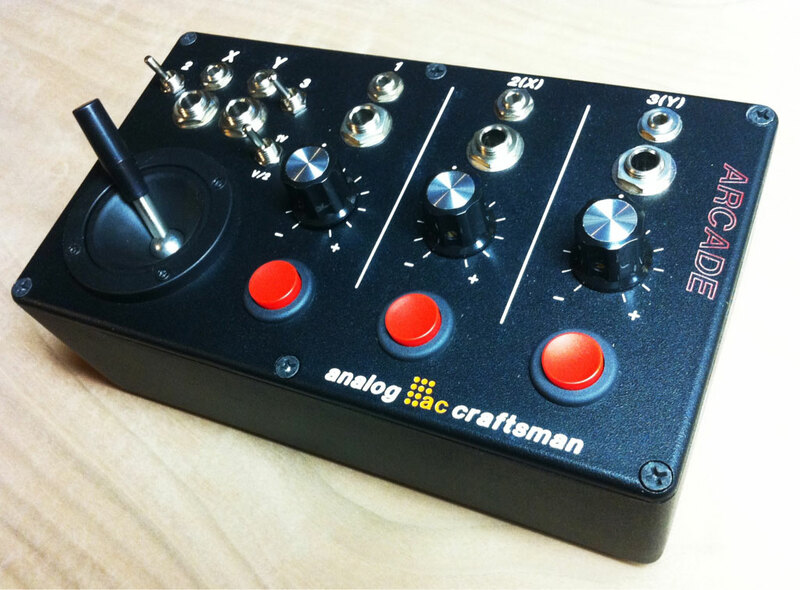 Have X control a VCO and Y a VCA and use the joystick like a Theremin. And? 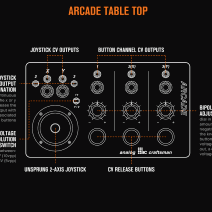 Two additional switches assign the X and Y axis to channels 2 and 3, allowing you to trigger the voltage from the joystick with those channel’s buttons, without losing the outputs of the voltage settings in those channels! And wait, there’s more… A voltage switch allows you to choose the level of resolution from 10vpp to 5vpp (to 2.5vpp on ARCADE 5U). Available in both a 5U and table top version, ARCADE TT has both ¼” and 1/8” outputs for integrating into both your euro and 5U modulars. 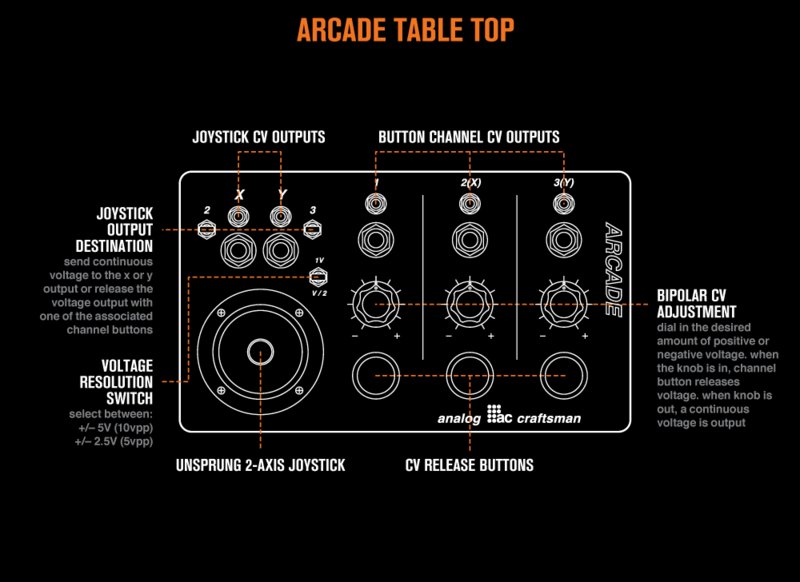 ARCADE can even control modern and vintage keyboard synthesizer and effects pedals! It also can run on a 9V battery so you can wield it live on stage! Please contact us for custom output configurations. Controlling the symmetry and high order of a Buchla 261e with ARCADE’s X/Y axis. FMing a MOTM 300 VCO and 390 LFO (in audio range). Also channel 1 of ARCADE is controlling the cutoff frequency of a MOTM 490 VCF. Triggering a Tama TS206 analog drum rack with ARCADE channels 2 and 3. Channel 1 is gating the audio from a Buchla clone dual 258J with a Mattson quAD/ASR. The X axis of the joystick is controlling the cut off frequency of a Megaohm Delta VCF.